The interpretation Board at Carsethorn. 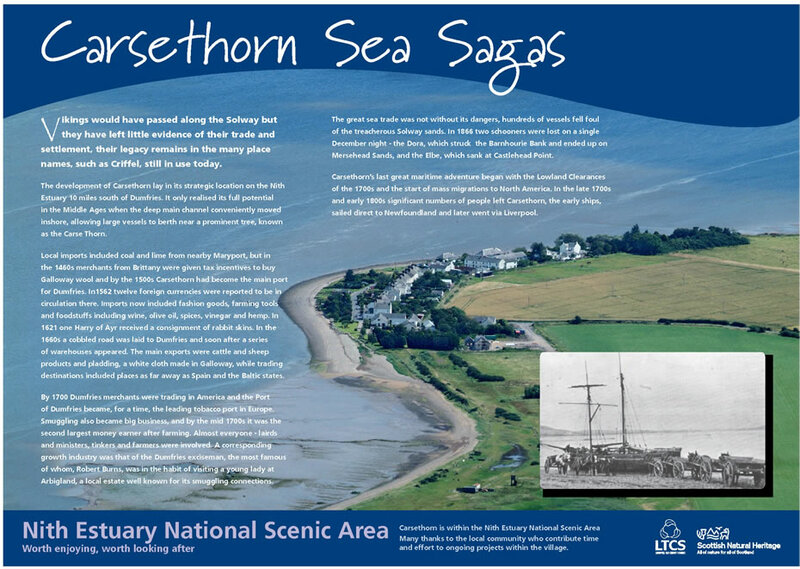 Carsethorn is part of the Nith Estuary National Scenic Area, so it is fitting that new interpretation boards have been installed which tell the story of Carsethorn village, its people, the sea and the local walks which can be enjoyed by visitors to the area. A start on this project was made seven years ago when a method of recording the families who had emigrated from Carsethorn during the lowland clearances was produced. An oak log, shaped like the hull of a ship, was placed near the foreshore with the family names and numbers marked with copper nails and an information board was erected for public information. This was followed two years later with the tidying up of the square, hedge and shrub planting, re-seeding, the screening of the recycling bins, resurfacing and the replacing of the corrugated iron bus shelter. The fixing of the interpretation boards in the new bus shelter which is made of larch and doubles as an information point and bird hide with views to the sea for bird watchers, represents the final phase of the renovation of the square where buses to the village turn. Above the information centre is a wind vane with a scaup (the most common sea bird locally) on top with indicators to Liverpool where most of the emigrants made their first port of call en route to Australia and other destinations including distances to places like Newfoundland where other brave soles left Carsethorn, sailing non-stop. The other leg of the weather vane indicates the direction to the top of Criffel, 1,800ft tall, which provides the backdrop to the parish landscape. "The interpretation panels tell the story of Carsethorn village and it's people, the sea and fishing life and the local walks to be enjoyed by all," says Kirkbean Heritage Society Chairman, John McMyn. "Local bird life is pictured on the fourth panel. "Carsethorn is in the Nith Estuary National Scenic Area and this is all part of telling the world what a wonderful place we live in."